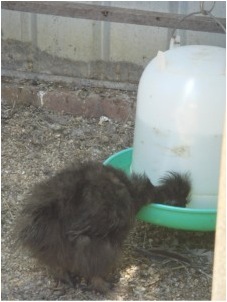 Fresh water is essential for chooks. Chooks should have full time access to clean water and good quality nutrition with the right balance of all the essential nutrients. If the balance of nutrients is wrong the egg production or the bird health will suffer. The best feed for backyard chooks is a good quality commercial organic pellet. There are several brands of these on the market that provide your chickens with all the essential ingredients. We also give our chooks a few handfuls of grain each day which is a mix that includes wheat, sunflower seeds and corn. We also make sure they get lots of greens and we grow some additional silverbeet, lettuce etc in our veggie patch for them. Chickens also love lawn clippings, some kitchen scraps, weeds and bugs. To produce egg shells chooks need a constant addition of calcium in their diets. We have a container of shell grit in each of our chook houses. Shell grit also helps the chooks grind up the food in their crops.